The longstanding gap in unemployment rates between lesser- and higher-educated workers is narrowing, new figures reveal. In the last decade, jobless rates for residents with no higher than secondary education have generally been one to two percentage points higher than for those with diplomas or degrees. This gap all but closed last year, according to figures from the Ministry of Manpower (MOM). The unemployment rates for those with primary education and below, lower secondary and secondary education were 2.5 per cent, 2.8 per cent and 2.9 per cent respectively, similar to those with diplomas and degrees: 2.8 per cent and 2.7 per cent respectively. "The improvement in unemployment for the less educated was supported by strong demand for low- and mid-level workers," said the MOM in its report. Economists told The Straits Times that factors such as a tighter foreign labour policy could have contributed to this. Since 2009, the Government has introduced stricter quotas and higher levies, which apply largely to lower-skilled foreigners. Though the qualifying criteria for higher-skilled foreigners on Employment Passes has been tightened, they do not face quotas or levies. "Employing locals to fill the manpower shortage or gaps looks like the logical stop-gap measure," said OCBC economist Selena Ling. She expected the tighter foreign worker policy to continue to benefit the low-end job market in the next few years, especially in the construction and service sectors. Barclays economist Joey Chew said the latest figures may also come down to the retirement of the less-educated baby-boomer generation. She noted that the number of less-educated employed workers also fell by about 8 per cent from 2008 to last year. 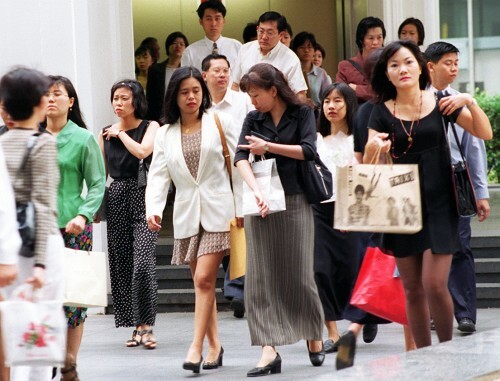 The unemployment gap has closed mainly in the last five years, which UOB economist Francis Tan puts down to industries such as food and beverage demanding lower-educated staff. He said: "They are facing a tighter labour supply situation and thus are absorbing more from the unemployed pool of workers, thereby lowering their unemployment rate this quickly." One group of workers, however, are not closing the unemployment gap. The highest unemployment rate, at 3.5 per cent last year, was among workers with post-secondary but non-tertiary education - such as those with A-level or Nitec qualifications from the Institute of Technical Education. Although their numbers are relatively small at about 7,000, Ms Ling said they could be a "sandwiched class" of workers facing low demand for their labour.